In 2019, this event will be held in Pullman, WA and Moscow, ID on March 7-10, 2019. Recipients of this award will receive all conference fees paid, a portion of transportation, lodging, and food expenses. How much of each is dependent on how many awards are given and where the event is located. This Year, because the event is in the West, OSHET expects to take more participants - this may include driving or flying, this is to be determined after participants are chosen. OHSET is planning to take (2) adults with the youth who attend. The scholarships, while significant, will not cover all cost, athletes should be prepared to do some fundraising on their own to help cover cost. For those wishing to apply for this opportunity, please Click Here for the application and instructions. Congratulations to Jayme Campbell for winning the Raffle this year. Oregon High School Equestrian Teams, Inc. is on track to support athletes and their equine partners for another 20 years. You may be familiar with OHSET or learning about it for the first time. If you enjoy horses and are supportive of extra-curricular activities for youth, you may want to consider supporting OHSET through a donation or sponsorship. Keep in mind, no donation is too small and OHSET can also benefit from donations of services and products. As a nonprofit organization, your contribution to OHSET may be tax deductible (please check with a tax advisor for more information). Click Here for more information. Support OHSET when you Shop! You can help OHSET earn donations just by shopping with your Fred Meyer's Reward Card. Fred Meyer is donating $2.5 million per year to non-profits in Alaska, Idaho, Oregon and Washington, based on where their customers tell them to give. [Click Here] for the details! This article was published on Equis Feed's Website - "OHSET State Championships: A story of sportsmanship overcoming adversity" Click to View Article. 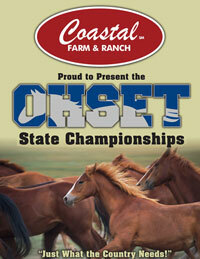 OHSET thanks Coastal Farm & Ranch for your support and sponsorship!